"Improved brakes" - different motorcyclists put different meanings to this phrase. Brakes are optimized on a variety of factors, and the weight of each factor depends on the operating conditions. For the sportbike pilot, it is important that the brake retains its functionality when heated up for a long time. They use ergonomic adjustment in real time, allowing you to adjust the position of the lever. Complex ventilated calipers, brake rotos, and titanium cylinders are installed on motorcycles. All this is expensive and has no effect in civilian use. The ratio of the master cylinder is also selected, which may not be the most optimal with single braking, but the best under continuous load. For a stunt rider, it is important to easily brake with one finger (hand brake), therefore, a big ratio of the master cylinder is selected. The handbrake reacts even to a light click, but the brake doesn't work when overheated. For an enduro rider, it is important that the brake remains operable when heavily contaminated. Performance is not as important, because a bad grip of the wheel limits the ability of any brake. This allows you to use a simple, reliable, and cheap system. For a street rider, the brake should provide a minimum braking distance during single braking, and a rather high ratio is desirable so as not to put too much pressure on the wrist while riding. System operation under continuous load is not as relevant as it is for professionals. The braking system effectiveness is limited by the grip of the tyres, the geometry of the motorcycle and the stability of the suspension. A sport bike has a short base and a upright fork - during braking almost the entire load falls on the front wheel. Therefore, a progressive fork is used, which steadily presses the wheel against the concrete, and wide tenacious tyres, which allow greater contact with the surface. This configuration allows more powerful front brakes, because it makes it impossible to go into a skid - the more you brake, the stronger the wheel is pressed against the concrete, and the higher the friction force is. Enduro and motocross motorcycles are equipped with long-stroke soft suspension, which allows riders to jump and navigate obstacles. Such suspension can not steadily press down the front wheel when braking. Motorcycles of this class also have narrow off-road tires with little surface contact, so there is no point in installing stronger front brakes - they will easily turn the wheel into a skid and add a lot of weight. On choppers and cruisers with a long base and a forward fork, when braking, the front wheel is loaded less. The front brakes are weaker than on sportbikes and roadbikes, despite the large difference in weight. Plus suspensions are adabted for a comfortable ride. On such a motorcycle, it makes no sense to use multi-piston calipers and two discs, which we would not be able to use at their full potential, and which could lock the front wheel at the slightest deterioration of the traction. 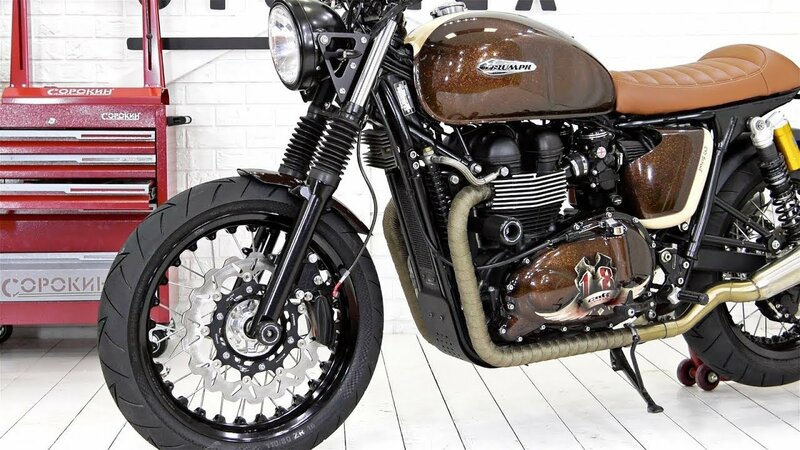 Triumph Bonneville is one of the most popular models for customizers, largely due to the base and geometry. The base of the motorcycle is not very long, so with a slight decrease in fork offset, wheels and suspension replacement, it is possible to achieve intensive and strong loading on the front wheel to make high-quality front brakes. Good projects based on Bonnevile have powerful front brakes that are not only an accessory, but also a fully functioning system. The standard brake system on the Triumph Bonneville is optimized well for the overall configuration of the bike. But the motorcycle itself is technically obsolete, and does not correspond to modern conditions of operation. Simply put: it is much faster to accelerate on it but not to brake; on a curvy road, you will have to slow down fast, delaying the traffic flow, because there is no feeling of a stable traction on slopes. In its standard version, the motorcycle is not urban, but suburban. The cheapest way to pump the front brakes is a floating disc of a bigger diameter and a caliper within increased piston area (the 4-piston Brembo 30/34 and 6-piston SPIEGLER/ABM work well). But without a fork upgrade this setup will not be significantly more efficient. In this video, we showed a simple way to install a non-standard caliper: using an aluminum adapter. The standard brake hose is a bit short, but in our case there was already a steel one. As a result, we can say that such system is good in terms of price / quality ratio. The dual disc brake, which we did on our SXRacer project, works better, but requires a whole range of complex expensive modifications.